Coming this September from Warner Home Video is the Peanuts: Emmy Honored Collection, a two-disc DVD collection of 11 Peanuts specials that were either Emmy Award winners or nominees. The set features two specials that are being released on DVD for the first time in the U.S.: What Have We Learned, Charlie Brown? and Why, Charlie Brown, Why? Somewhat inconveniently, however, you'll also get nine other previously released specials that may already be in your Peanuts DVD collection. Note that this set is neither a complete collection of Emmy Award winning Peanuts specials, nor of the Emmy nominated specials. The better known specials A Charlie Brown Christmas and A Charlie Brown Thanksgiving also won Emmy Awards, and 13 other animated specials not on this collection received nominations. You can see a complete list of all the winning and nominated Peanuts shows at the Peanuts Animation and Video Page. Warner touts that the shows have been "brilliantly remastered in all-new 4K Ultra HD transfers," and while that is true, the difference in quality between this release and earlier Warner DVD versions of the shows is likely to be small. All the previously released shows had already been remastered and looked quite good for their initial appearances on Warner Home Video DVDs, and more to the point, since DVD is a standard-definition format, it cannot take advantage of the high resolution of the remasters. Sadly, no high definition Blu-ray version of this set, which would have shown the remasters to much better effect, has been announced. There are no bonus or special features on the set. 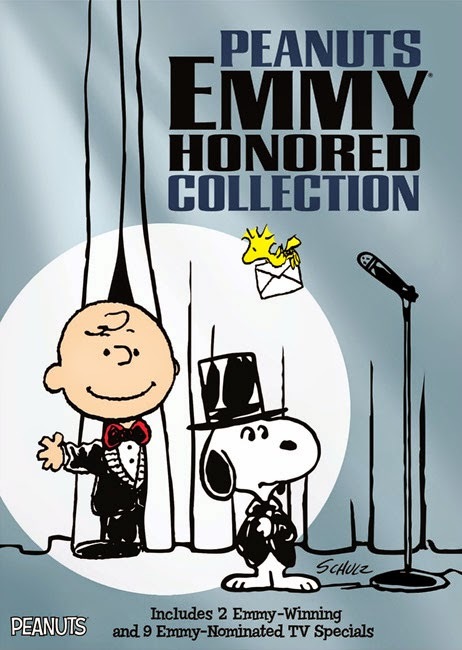 The Peanuts: Emmy Honored Collection DVD set will be release on September 15, 2015 has a suggested retail price of $26.99, and can be pre-ordered from Amazon and other stores now. They are so frustrating. Why don't they just release a complete box set--or at least complete 80s and 90s sets? If there's a perfect time to release them all, the release of the movie is the time. I know nothing about marketing, but I'm willing to bet a complete set would sell better than these partly-new-partly-old sets. While I am happy to have two new episodes, I would really like to have complete 80's and 90's collections as well. I am amazed we have not seen this yet. Yes, it's good news that Bon Voyage, Charlie Brown is finally coming out on DVD. We've got our own news post about it as well.